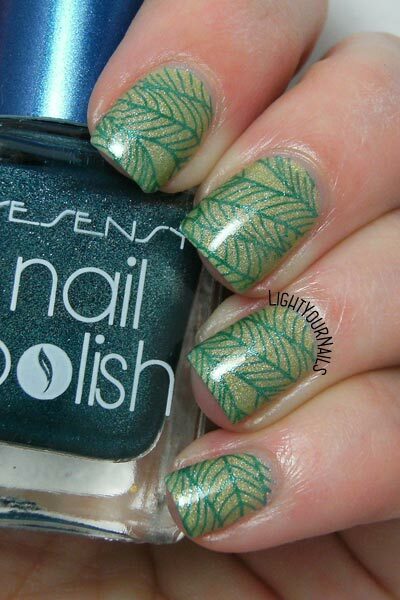 Green leaves nail stamping | Light Your Nails! New day, new nail art. You wanna forgive me if it’s monochromatic green again! In my defense I can say the base colour is a yellowish lime green and the stamping polish is teal, although with such a thin pattern it came out green indeed. More details? The base colour is Liquid Sky Lacquer Blue Hawaiian, which is a thermal nail polish shifting from lime green to pea green. My bottle is quite old and the thermal effect vanished almost completely. Now the colour is lime green leaning yellow all the time. Stamping polish is from a Chinese brand called Yesensy. 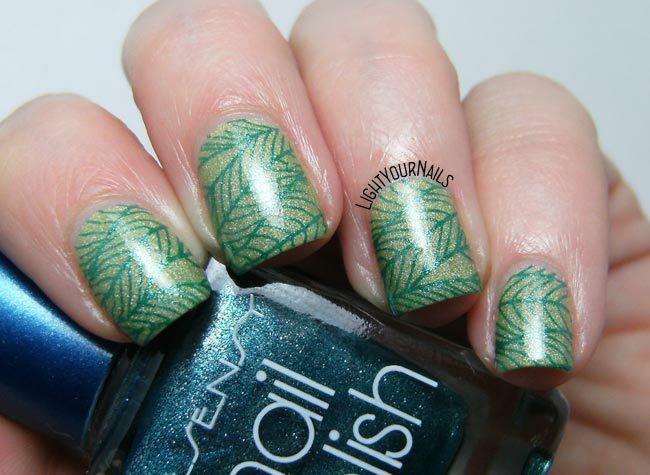 I bought one of their foil nail polish in a dollar store and it works so great for stamping. I went back and bought two more shades. I actually had to go to another store because that one had closed down and I paid them a little more but who cares? It’s still so cheap for such a big bottle. Lastly I used Floral BPX-L018* stamping plate by Bornprettystore, which is full of floral patterns, as the name suggests. If you follow my blog you might know my favourite designs for stamping are florals and geometric so I just fell in love with this plate immediately. Needless to say I used a super thin pattern and no special stamping polish and this is the outcome. Bornpretty rocks its stamping plates. I think that’s it for today. I hope I wasn’t too boring with a green nail art again. What do you think of it? Do you like it? this is so refined and simple. I love it. The plate is very pretty and I love how you used it. Lovely combination of image and colours. 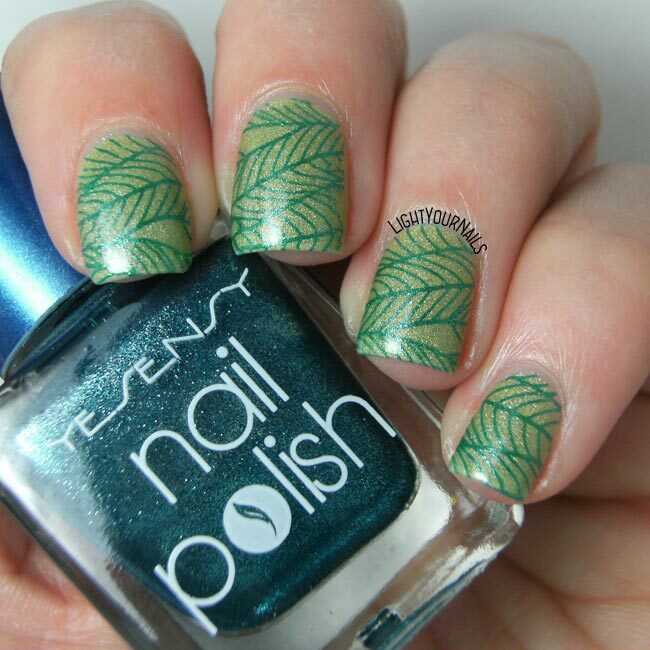 Don't you dare ever apologize for a green manicure! I just get more excited when I hear "green"! This is fun! Haha thank you! I am so glad someone else is obsessed with green! Hai ragione, sono tutti così belli! Great color combo, love the plate! Perfect for Earth Day! Aww thank you so much Ithi! 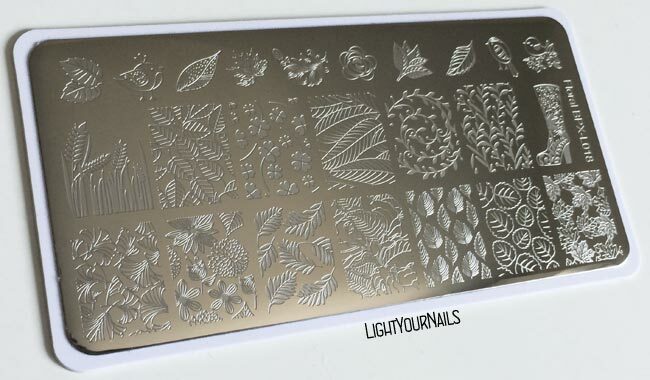 I have that stamping plate too, love that image!